This is not intended to be an exhaustive guide, but something to help you avoid a lot of pitfalls that newcomers to gardening sometimes fall into. Please have a read though it, it may answer some of your basic questions. Please don't hestitate to post on the forums anything you still feel uncertain about. It is understandably tempting for a newcomer to the world of growing veg to want to get on with it in their enthusiasm. Unfortunately in their eagerness, two key ingredients are overlooked. Patience and the back of the seed packet. Yes its very tempting to try to get your plants going early, but stop and think  if you do and you manage to raise them successfully, are the conditions going to be suitable for putting them in their final place? It is often the case that more productive, stronger plants are obtained from late sowing. Early in the year the days are much shorter and the seedlings suffer from lack of daylight. One of the main pitfalls for the newcomer, in my opinion, is the heated propagator. These are fine if used for seed and plants that need a high temperature, but over the years we have seen many disappointments with them being used for unsuitable seed. Tomatoes, Chillies, Peppers etc are suited to them, seed such as brassicas, for example, which are very hardy are not. What does it say on the back of the packet? Always a good guide. Does it mention the requirement for heat to give good germination? If it doesnt, dont do it. Some seed, such as lettuce, for example, will give poor germination at higher temperatures, along with weak plants. Personally, I would not use them for seed such as courgettes etc.  plants that whilst not winter hardy, are eventually going to grow outside. I find indoors inside a sealed polythene bag more than sufficient. In any event  whether in a propagator or bag  the lid or bag should be removed AS SOON AS germination takes place, otherwise the plant will become drawn, or leggy. A simple & cheap aid to prevent this is placing the seedlings on a window ledge, with some aluminium foil behind the pot/tray to reflect the light back. This can nearly double the amount of reflected light. There is no need for fancy arrangements here, simply put the foil underneath the pot/tray and fold it upwards behind the seedlings. With a couple of nips & tucks in the right place it will be self-supporting. Plants raised in this manner and destined to go outside will need "hardening off" before planting out. This will mean, for example, one week of putting them outside during the day time and bring in at night, followed by a week of leaving them outside all the while. They will then be adjusted to the outside temperatures and so won't receive a double shock when they are transplanted. If youre new to growing, the best advice is to grow what you know you will eat and not try anything too fancy until you have more experience. You will have to think about this in conjunction with the amount of space you have available. As much as I like peas, they take a lot of space compared to the return and if pushed for space, youd probably be better off with a crop giving a greater yield. The same goes for potatoes, if you have little room, a large bag of maincrop spuds does not cost a lot, and youd be better off concentrating your efforts elsewhere. Early, or New potatoes would be worth considering as these are more expensive to buy. They can even be grown in large tubs etc. on your patio, so as not to take up valuable space. Think about runner beans, these are quite expensive to buy, but relatively easy to grow, with the advantage that they grow upwards, not outwards & thus do not take up the space. On the other side of the coin, carrots, for example are cheap to buy, but you cant beat the flavour of those grown in your own soil. Tomatoes are also worth growing purely for their superior flavour. Even if you have no greenhouse, there are many varieties you can grow outside. When all is said & done, the final decision is yours, but we hope this has given you some points to consider. Oh  and dont grow too many courgettes. I would just like to under score one thing and that is the use of rotavators. They are fine in their place and best used on clean ground. On overgrown plots you may find you have pernicious weeds, such as couch grass, bindweed & mare's tail. A one off rotavation of the plot will merely chop the roots up into 10 times or more viable pieces and replant them for you. It may seem like hard work, but in the long run it pays dividends to turn the soil over by hand and fork out these roots in one large piece rather than numerous small ones. The small ones are easily overlooked and you may find it worse that when you started once they begin to grow. This thread is not intended to be an exhaustive guide to every vegetable going. You can find information about individual veg by looking through the main site, searching the forum and reading books. Did I also mention the back of the seed packet? 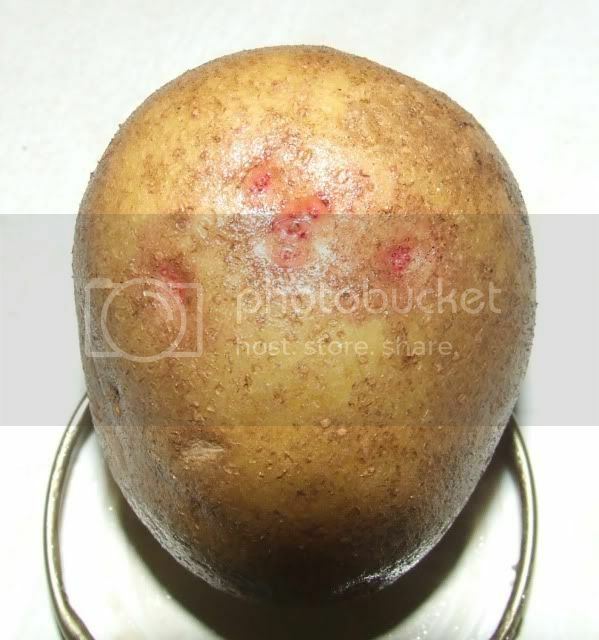 One veg though that does raise questions throughout the year is the humble spud. The first one to crop up is to chit, or not to chit? This is the act starting the potato into growth before planting, with the intention of getting a head start. The jury is out on this. Some say to chit only early varieties, some say chit all & a newsletter put out recently by a supplier says it's not necessary to chit any of the modern varieties at all! From my own point of view, I find chitting a good method of storing the spuds prior to planting if nothing else. The seed need to be kept in a cool place in any event to stop them producing long white & weak chits, so why not do the job properly and set them up in a cool, light place? I use a greenhouse with sufficient heat to keep frost off. 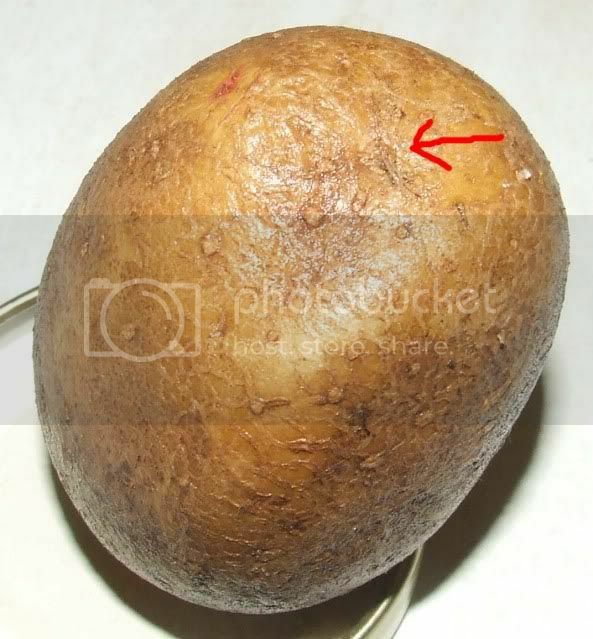 The other end of the potato does not have many "eyes" and you should be able to see a rough dried area where the potato was joined to the parent plant. I suppose this is similar to your belly button! That's it for the time being, if any other common uncertain area arises, I will add to this thread.